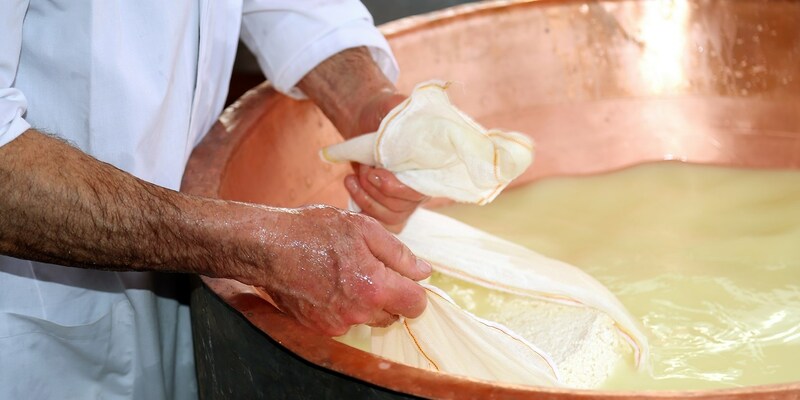 Whey is the liquid that separates from curds during the process of making cheese or yoghurt, but shouldn't be seen as a lowly by-product. Whey has been enjoying a rise in popularity in recent years, thanks perhaps to an increased awareness about food waste and a growing love for good bacteria-rich ingredients. It adds a unique twist to dishes and, depending on the type of whey used, has a richness and acidity that provides a boost in flavour. There are two types of whey – sweet whey, that has been made with rennet; and sour whey, which is the liquid that's released when making yoghurt or soft cheeses like ricotta. Sour whey is the type that has caught the imagination of foodies recently (sweet whey is often dried out to make protein powder for the health-conscious). It is full of bacteria that are great for kick-starting fermentation in vegetables, and full of gut-friendly microbes. Despite its many merits, whey often gets poured down the drain at industrial dairy operations, or ends up in animal feed – not the proudest end for this mighty product. As it can be seriously tricky to track down in shops, Brighton chef Michael Bremner has kindly given us his delicious yoghurt whey recipe, which he uses in a number of dishes in his restaurant, 64 Degrees. This recipe will also provide plenty of luscious yoghurt for you to enjoy in plenty of dishes. As Michael notes, the yield will depend on a number of factors, so be prepared for varying whey-to-yoghurt yields. As with any process that involves fermentation and bacteria, ensure that any equipment you plan to use is sterilised before you begin. Whether you choose to use whey for fermenting or simply as an ingredient, there are plenty of recipes around to provide inspiration. Michael Bremner's cured mackerel dish is served with gooseberries fermented in whey for a punchy, slightly salted flavour. Kevin Mangeolles cooks carrots in a tangy goat's whey, using lemon and a drop of vegetarian rennet to split the milk. Dean Parker of Sorella is a huge fan of the ingredient – the whey emulsion he makes for his mushroom gnocchi recipe makes an appearance in many dishes at the restaurant, adding a tangy richness to a number of sauces.